fine water: Didn't have the heart to tell her it was all downhill from there. Didn't have the heart to tell her it was all downhill from there. Found this old photo from a school we did a few years ago. 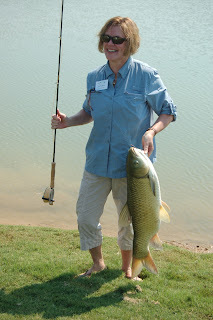 Maybe a half dozen casts or so into her fly fishing career, this lady nails a grassie. And a fine grassie at that. Kinda like taking a mountain climbing class and then summiting K-2 later that day. Plain old black woolly bugger, in case you were wondering. I wish I was her, almost. A good friend of mine once said "luck beats skill everytime"... kinda his own version of "better lucky than good." Awesome! My first fish on a fly was a carp...but common, and grassies are much much harder! Know what you mean, Gregg. I had been trying to catch those grassies for a month. She steps up and sticks one in about 5 minutes. Yep, I agree Jay. Gimme luck every time. I don't know, Erin, to have your first fish on a fly be a carp, common or grassie, darn impressive either way. Yeah Nate, it was pretty amazing. I was happy for her. Sort of. This proves that even the beginner can land the fish of a lifetime. Some individuals have all the luck when it comes to landing out this world fish. Congrats to this lady!!!! Yup Bill, sometimes it just comes down to being in the right place at the right time.